Will Glacier Gloves finally win us over from pogies? Gloves vs. pogies. Like so many similar debates (paper vs. plastic, cloth vs. disposable), it probably comes down to personal preference. The other day, we tested gloves and pogies on a 15-mile paddle. Water temperature: 36 degrees. Air temperature: 40 degrees. Winds: 5 to 10 knots. 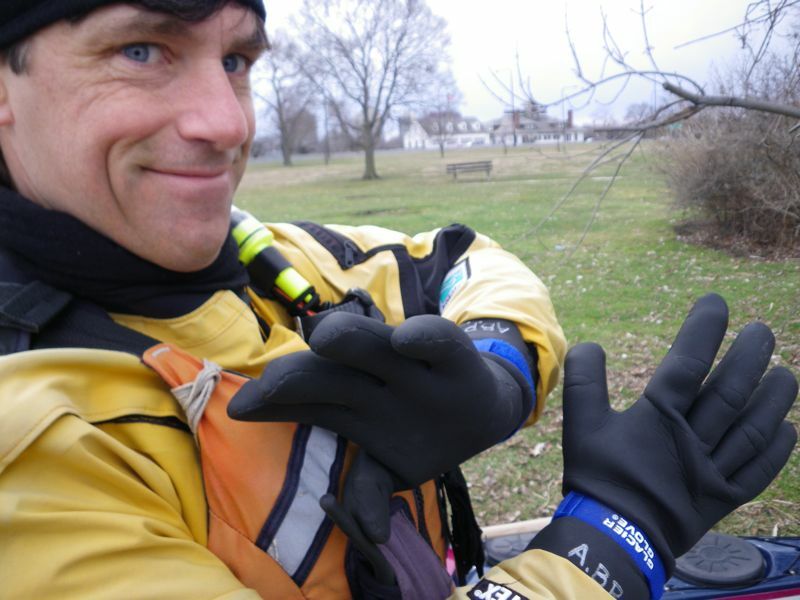 We gave gloves their best shot, using Glacier Glove's neoprene Premium Paddling Gloves. We've tried a lot of other gloves, and we've found most to be too thick and inflexible to allow us to use our fingers for much of anything. By contrast, we were impressed by the amount of dexterity we had with these gloves. We were able to put on our spray skirts, take photos, raft up and hold each other's decklines, and even push the tiny toggle on the camera that switches between still shots and movies. Can a low-frequency horn be heard further than a high-frequency whistle? On a recent trip to West Marine, we came across this funny-looking low-frequency marine horn. We thought its sound might travel further than the sound of our ordinary marine whistle. So we tested them in the harbor--Alec with the horn, Sharon with the whistle--moving incrementally away from each other. There are a couple of problems with this experiment, of course. We didn't control for different lung capacity, different hearing ability, or the minimal effect of the light wind in the harbor. Nonetheless, we were able to hear the sound of the marine whistle a little bit further than the marine horn. 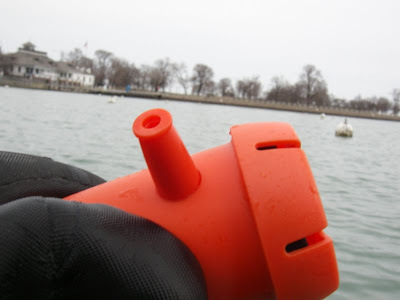 The horn is also much larger than the whistle--too large to stow in a PFD pocket. After today, it may not see much more of Lake Michigan. We share a few of our favorite Lake Michigan put-ins with local dog-walkers and their four-legged charges. Today, while we were loading our boats, a man drove up in a minivan full of dogs, including one the size of a small horse. Come back here and show me your pretty face. 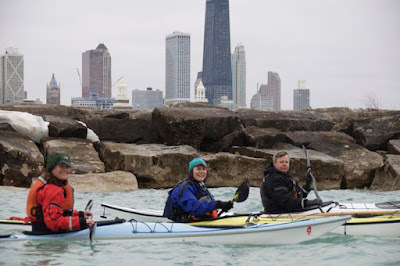 With Canoecopia over and a serious case of spring fever afflicting us, and Justine Curgenven visiting before returning home to Wales, we decided to get out on the water with friends Bonnie Perry and Paul Redzimski. ...Justine stayed warm with a little frisbee. Justine seemed a little disappointed that there was no more ice on the lake. (She had seen our photos in an earlier blog post.) But that certainly made the put-in easier. North Avenue beach, where we could now carry over exposed sand. 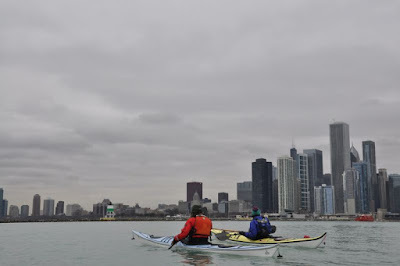 With the wind blowing out of the north, we paddled south along the shoreline to Navy Pier. It's calming to be on the water, with the sounds of the city muffled and so much open space around us. We always wonder how visitors like Justine experience our home marine environment. As we rounded the Pier, Chicago's skyline came into view. 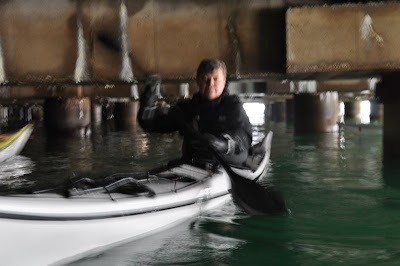 Paul explored the sea caves beneath Navy Pier. We threaded our way through the remains of Dime Pier. Realizing that we would have to paddle against the wind on our way back (and not to wanting to be responsible for getting Justine to the airport late), we turned around and paddled north. Heading Northeast to the light house. We were the only people on the water. We stopped to look at the remains of winter ice on the break wall. We landed and loaded up, a little colder but certainly happier for having gotten out. 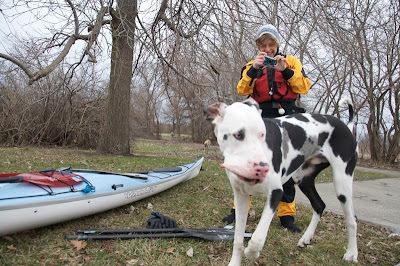 Canoecopia is the official start of the midwestern paddling season. 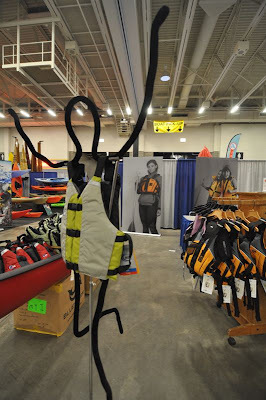 For those who don't know about Canoecopia, it's a paddlesport exposition--part trade show, part conference-style presentations, part paddling friends reunion--that takes over the Alliant Center in Madison, Wisconsin for three days. 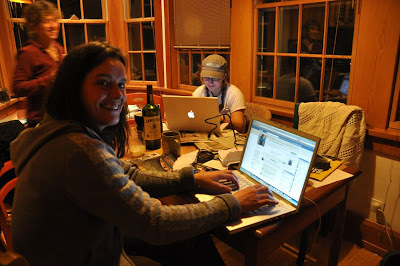 Justine and Hannah Facebook each other from across the table and across the Atlantic. The next day, we drove up to Canoecopia, arriving in time to watch the vendors finish setting up their booths. 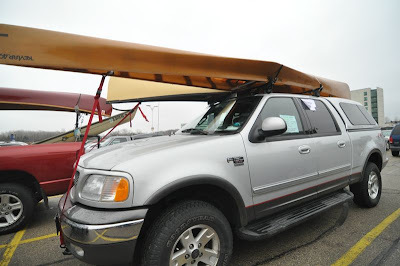 There were boats, paddles, clothing, tents, magazines, outdoor programs, jewelry....pretty much everything that relates to paddlesports and camping and then some. The parking lot was filled with cars and boats of all types. 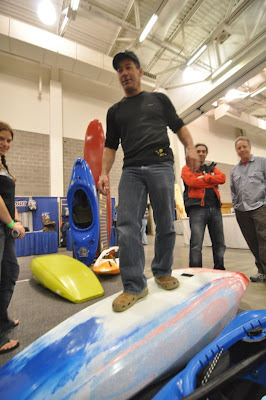 Eric Jackson demonstrates the hull strength of his boats. 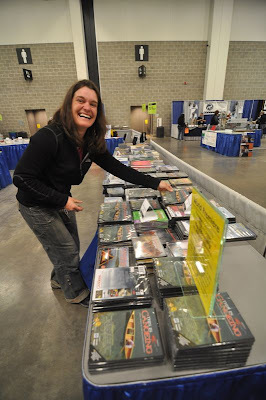 Justine was happy to see so many DVDs for sale. Funny, all these stacks seem to be "This is Canoeing!" Over time, more and more people arrived. It was enough to cause an otherwise calm mannequin to run away screaming. Hey! 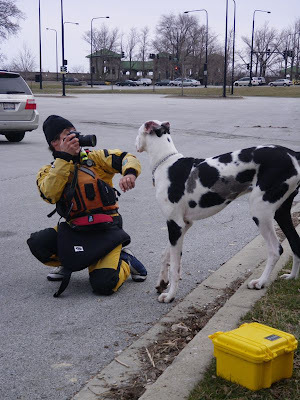 Get back here with that PFD! There seemed to be slightly fewer vendors this year, but interest was high and sales were good. The presentation schedule was packed with a mix of practical and inspiring sessions, and many that managed to be both at once. Gordon Brown and Sean Morley, going over the day's plan. The hard part was choosing among the offerings. In the end, it came down to selecting classes that took advantage of the current, surf and rocks, or attending the revised BCU 4-star training. After much consideration, Alec chose the 4-star, based on the location, last year’s description, and the fact that Gordon Brown and Tom Bergh would be leading the class. 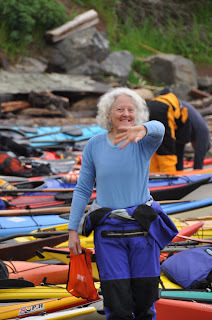 Sharon chose a “master class” on boat handling with Gordon Brown, rock gardening, and a class on riding the tides. In this, our last post from the GGSKS 2010, we’ll write about some of what we did and what we learned. The new 4-star is a leadership award. This means that beyond having to demonstrate a defined list of personal paddling skills, you are able to safely lead a group of four 3-star paddlers in specified conditions. 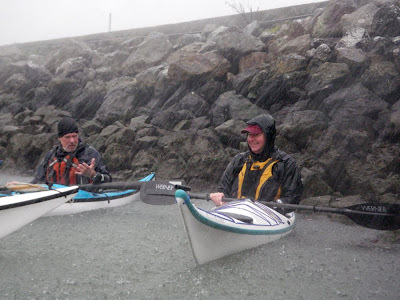 Gordon and Tom emphasized the gravity of the responsibility you take on by choosing to lead a group onto the water. The 4-star assessment also requires completion of a BCU-approved navigation class, a two-day leadership training and 2 day approved first aid class with CPR. 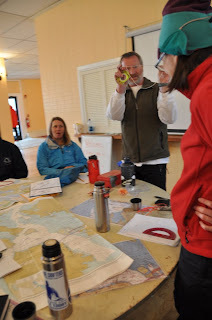 My first day involved a the full-day classroom-based navigation class, taught by Tom Bergh and Rob Avery. It was tough to travel all the way to San Francisco and spend a full day on dry land, although the weather made it a bit easier. The class was engaging and interactive, and covered a full syllabus of basic navigation skills, weather formation, rules of the road and buoyage. We created trip routes taking into account tidal currents, wind and as many other factors as we could glean from the charts and pilots. Though we stayed dry ourselves, the content was anything but. The four-star training included group management under the Golden Gate Bridge. Day two began the 4-star leadership training. 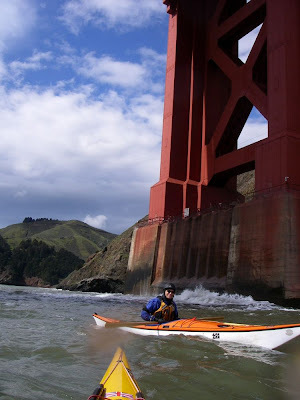 After warming up and practicing some group management exercises on the water, we headed out to a point just below the north tower of the Golden Gate Bridge. The ebbing current created an eddy line that grew stronger by the minute. Crossing the eddy line wasn’t that different from what I’ve done on river trips ( larger for sure), but we also had swell to contend with and the consequences of missing the eddy were serious: being pushed out under the bridge and into the busy shipping channel there. Our group of 10 gathered in the eddy near the base of the bridge and watched as another class played in the current. 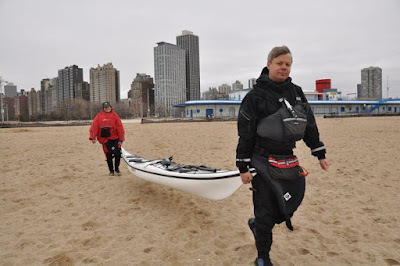 Then, one at a time, we broke out and paddled up current along the shore. The savvier paddlers waited for the swell and took advantage of the push it gave them, make the break-out easier. My timing wasn’t perfect, so I had to use a fair amount of muscle to keep my kayak pointed into the current. I know how I’ll try to do it next time. Tom Berge watches as the four-star trainees leave the harbor. Day three promised the best weather of the weekend: partly sunny, moderate winds, and diminishing swell off Point Bonita, the last tip of land leading from the entrance to the bay. (The waves there had been 20 feet the previous day.) 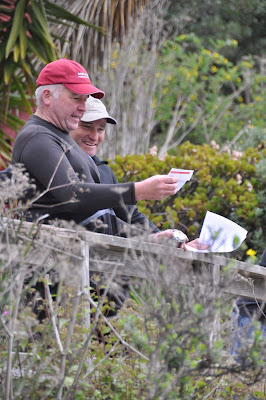 But there was a tsunami warning predicted for 1:10 p.m., which caused some concern within our group and divided opinions about what this would mean inside the bay and what actions would be appropriate. In the end, we agreed to paddle out past the gate and explore along the Marin Headland, with the understanding that we would keep our activities within the remit of a 4-star ( up to 2 knots of current, within 1 mile of shore, up to 1-meter waves or surf and no more than a 2-mile crossing) and return before the tsunami’s predicted arrival. As we headed out, Gordon had us pair up for what he called the “anxiety exercise”-- rating how much anxiety an activity created for us each. First we did an activity on our own. Next our “buddy “ closed his eyes while we directed him through the same activity. Then we rated how much personal anxiety we had versus how much we felt for the person we were guiding. We traded places and did it again. Overall, we found that when we guided someone else, we tended to transfer concern for ourselves to the person we were guiding. A light-bulb moment. The paddle out past the gate was beautiful. We saw swell crashing among the rocks, creating wonderful play spots( beyond the remit we were allowed to paddle this day), and landed on a small beach with nice 3-foot waves. We returned on a flooding tide before the tsunami arrived. After lunch we finished our last day on the bay practicing rescues in an eddyline just around the corner from the harbor. Towing against the current during the four-star training. 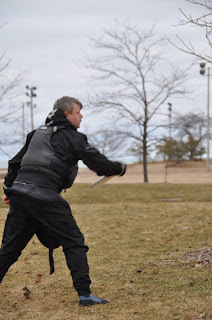 I ended up feeling good about the skills I have honed predominantly on the Great Lakes. 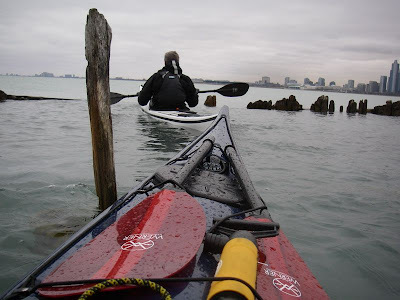 That being able to paddle in such a dynamic environment as the San Fransisco Bay was challenging, stimulating and left me wanting more. I chose to take classes that promised exposure to top-notch coaches, to conditions I hadn’t experienced, or both. The course I chose for day one, “Master Class with Gordon Brown,” was (no surprise) oversubscribed. Nineteen people signed up for it—a ratio far beyond reasonable—so the class was divided in three and we rotated between Gordon, Steve Scherrer and Ben Lawry. The weather also imposed restrictions. Twenty- to 30-knot winds gusted to 45 at times, flipping unprepared paddlers before they knew what was happening. Rain pelted us for at least four hours, and at one point we were pretty sure we felt hail. So we stayed in the harbor and used the opportunity to explore basic principles of boat control using mostly the sweep stroke and from the perspective of these three phenomenal coaches. A friendly blow hole just west of the Golden Gate Bridge. Day two was supposed to be “rock gardening,” but two things conspired against that plan: bigger-than-expected wind and swell, and a glass boat that I was terrified to damage. (I had rented an Avocet LV from Rob Avery, and it turned out to be a Kevlar beauty.) Our group paddled out to Angel Island, where we were able to do some limited rock gardening along with some wonderful sight-seeing. It’s hard to complain about going for an all-day paddle with good people in a beautiful place. 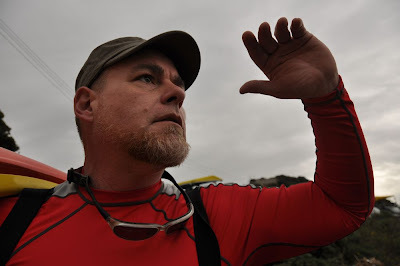 And I was on the water when the remains of the tsunami rolled through: three perfect 8- to 10-foot waves, gentle to ride but unnerving in their connection to the destruction in Chile. This left me yearning to learn something new on day three—a desire I confessed to Steve Scherrer, who was leading one of the classes on riding the tide. This time I was not disappointed. Steve talked about the types of flow: the laminar flow of unobstructed water, the helical flow of water that encounters an obstacle, and the up-and-down flow of water that mainly stays in place behind an obstruction. Then we went out and explored what this meant for how our boats move. We learned which blow-holes we could get up close and personal with, and which required us to keep some distance; we played in some currents and gentle overfalls. 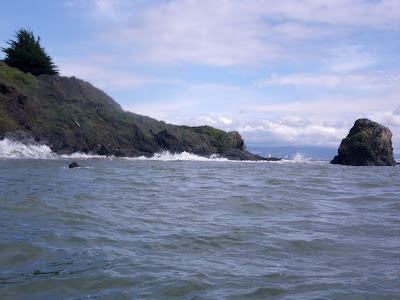 Then we headed over to the tidal race near Yellow Bluff, where the ebbing tide over a constriction creates standing, surfable waves. I had never before been in a tidal race. I paddled hard and caught a wave, riding it for what seemed like forever. I felt like I was covering a lot of distance until I looked over my shoulder at the bluff and realized that I was, if anything, moving backwards. The waves weren’t big enough to challenge my paddling skill, but they were emotionally draining. It’s good, sometimes, to go back to being a novice and recall how tiring it is to learn new things. 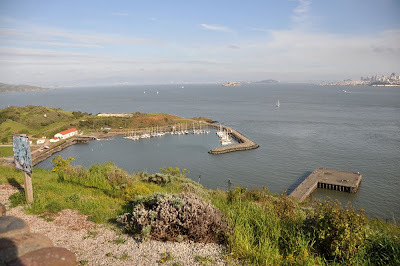 One of the rock gardening spots on Angel Island, seen from a distance. I wrapped up the day in the same place I spent my first day: the harbor. Mark Pecot and I hung out for some time, talking and rolling and generally trying to avoid the fact that the symposium was over. 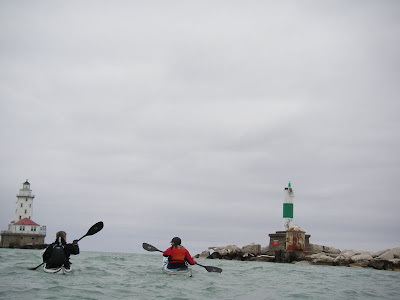 In the end, I also felt that my Great Lakes paddling skills had served me well, but the power of the ocean is categorically different. Lake Michigan waves, created entirely by the wind, can be big, but they’re steep and close together and lack the power of ocean waves. 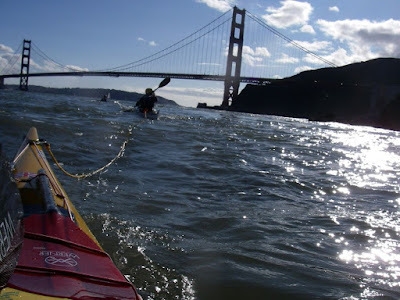 Four-knot currents are at the limit of what I can paddle against and even hold my position, but the ebb current under the Golden Gate Bridge was often more than five knots. I could easily have been swept out into the open ocean if I didn’t know what the water was doing. There’s a lot to learn out here and I hope to be back next year. 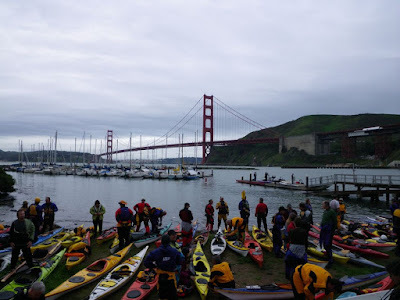 We just returned from the second annual Golden Gate Sea Kayak Symposium and we're still processing the experience and the photos. This was an unusual symposium for us because we attended as students, not as instructors. 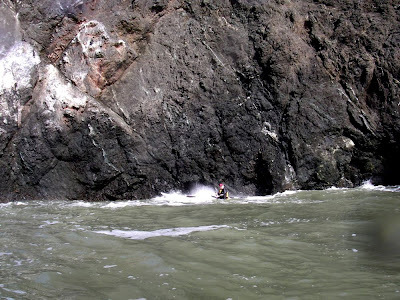 Alec took the BCU four-star training with Gordon Brown and Tom Burgh, while Sharon chose courses that would give her more experience paddling Pacific coast features like rock gardens and tidal races. We've always loved Marin County, where the symposium was based. Just across the Golden Gate Bridge from San Francisco, the Marin Headlands were almost developed in the 1960s but saved by a lawsuit and protected instead as part of the Golden Gate National Recreation Area. 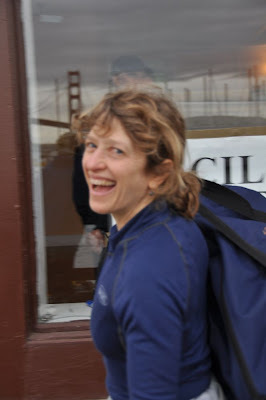 Coaches and participants stayed at the Marin Headlands Hostel, a former US Army base now converted into a hostel and arts center, and classes were based in Horseshoe Cove near Sausalito. An aerial view of Horseshoe Cove. We've visited this area more than a dozen times over the past two decades to hike the hills, explore the historic fortifications, and collect driftwood from the beaches. 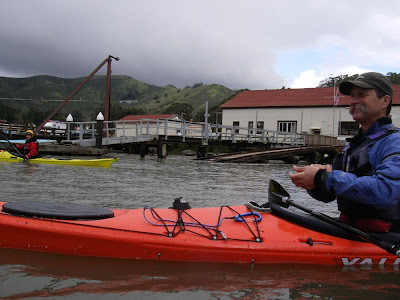 It's long been a favorite vacation destination, but we never paddled in the Pacific ocean or the San Francisco Bay. Until now. 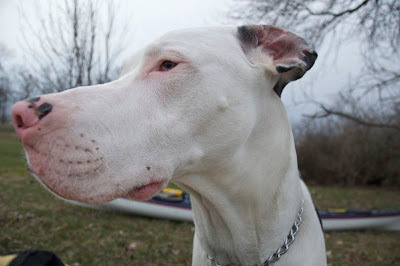 Sharon, gearing up for a day on the water. The symposium featured an all-star cast of coaches from around the world. (Check the website for the complete list.) But we were also drawn by the opportunity to meet many of the excellent but lesser-known west coast coaches who were the backbone of this successful event. We weren't disappointed. Cindy Scherrer isn't a lesser-known west coast coach, but she is one of our favorites. Ironically, we also spent considerable time with midwestern coaches Kelly Blades (an old friend) and Mark Pecot (a new friend). How odd to go 2,000 miles to hang with your home team. Check back tomorrow for more about the courses we took and the things we learned.